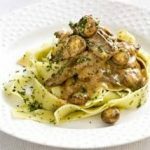 This Beef Stroganoff recipe is a Russian classic and I remember it since I was just a little boy. I really loved the sauce with the egg noodles. Cut 2 pounds of tender beef into narrow strips 1/2" thick and 2" long, season generously with salt and pepper and let stand in a cool place or in the refrigerator for about an hour. Make a roux by blending 3 tablespoons butter with 2 tablespoon flour over low heat until the mixture bubbles and is smooth. Gradually stir in 2 cups beef broth and cook the mixture until it begins to thicken. Boil it for 2 minutes and stir in 2 teaspoons Dijon mustard and 1 cup of sour cream, stirring constantly. Simmer very gently, without boiling. In a separate pan, brown the pieces of meat in 3 tablespoons butter, add the 3 cups of mushrooms and the 1 onion, both thinly sliced. Add the meat, mushrooms and onion to the sour cream sauce. Check the dish for seasoning and if necessary adjust.